FritzTheBrave.com is the award-winning Internet guide to the treatment of asthma in cats, with special focus on inhaled medications. Have you found this information helpful? Your assistance is appreciated to keep this site running. You may donate using the button below. Paypal is secure, easy and no account is needed. Other options can be found here. Welcome to Fritz the Brave! Hi, I'm Fritz. Welcome to my site devoted to helping cats, caregivers, veterinarians and animal care professionals understand feline asthma, its treatment and management. I'm a thirteen-year old Sealpoint Siamese who is enjoying a healthy and happy life despite having this life-long condition. I live with James and Kathryn and share the food dish with Shashee, Bijal and Soleil. You can learn more about my personal bio and family here. Along with my caregivers, I am pleased to offer the most comprehensive resource regarding feline asthma, reviewed and recommended by veterinarians world-wide since 2001. There's a lot of information here so take your time, come back often, and try the search feature to locate answers. Join one of the groups noted to the left for ongoing support and up to date accurate information. Feel free to write me with any comments or suggestions. Help available at Fritz the Brave! Tens of thousands of cats are successfully using inhaled medication daily to manage their asthma. We've made available a complete resource for inhaled medications for cats including Dr. Philip Padrid's protocol, still photos and videos of symptoms & treatment. If you are unfamiliar with asthma in cats and seeking general information, we recommend you study the Asthma Overview and Treatment areas of this site first. No two cats are the same so read about medication choices. Share your cat's story and gain personal support with online resources. To read the whole site, follow the Continue Reading links at the bottom of each page. Added stethoscope breathing sounds to Symptoms. The Feline Outreach Paws for Education Award is granted to FritztheBrave.com for outstanding education of feline caregivers. Feline Outreach is a charitable organization formed to promote the routine and medical care of companion animals, particularly cats. Every donation to Feline Outreach supports financial and educational assistance. Site fully updated so that all data are current. Photographs of the new product version of AeroKat™ with FlowVu are added to the gallery. Just discovered! Review the amazing videos that Cornell University College of Veterinary Medicine has made available. They cover caring for your diabetic cat; giving your cat a pill, capsule and liquid medications; trimming your cat's claws; taking your cat's temperature; and brushing your cat's teeth. Steve Dale of Pet World Radio interviewed Kathryn on Chicago's WGN Radio about Feline Asthma and this website. Listen to the high-quality audio or the low-quality (fast download) audio. This material is © 2006 Steve Dale's Pet World Radio. All Rights Reserved. Do not copy without written permission from Steve Dale! Added a valuable link (content since removed - Feb-2008) to breathing sounds that the VA-MD Regional College of Veterinary Medicine use to instruct. Added several other links of interest under Resources. Finished second in the "Non-fiction Publication" category for the Preditors & Editors 2005 Reader's Poll, sponsored by Critters, an online workshop/critique group for dedicated writers. was presented by James R. Richards, DVM, Director of the Cornell Feline Health Center, Cornell University. The entries were judged by Dr. Philip Bergman, and his comments included: ""This web site is VERY well done with lots of information that is thoroughly researched and well referenced, and most importantly it is personalized; it looks like it is from Fritz the Brave himself. Bravo!" The second award was the CWA Muse Medallion award in the category of Online Article - Health and General Care, and presented for the Inhaled Medication section of this website. Kathryn and James, with the help of Trudell Medical International, who produced the professional voice-over, present video of Fritz in classic asthmatic cough symptoms. We hope this short clip will be helpful in understanding the disease. 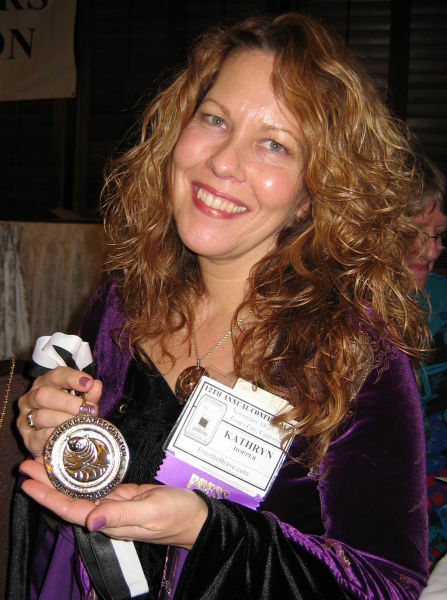 Kathryn was accepted as a member of the The Cat Writers' Association, Inc. (CWA) is an organization of professionals writing, publishing and broadcasting about cats. Dr. Betty Marcucci wrote two educational articles in December issue of Veterinary Technician journal. The technician handout for clients, plus the articles, illustrates using inhaled medications and features Fritz the Brave. A new Yahoo discussion group has been formed in German. A volunteer from that group has kindly offered to translate Fritzthebrave.com and will be available this year. Dankeschoen Ema. American Animal Hospital Association is creating a poster for veterinarian use educating on feline asthma and featuring some photos from Fritz the Brave. Fritz the Brave and Kathryn attended at the AeroKat® booth with Daphne and Zoe of the FAIM Yahoo Group during The North American Veterinary Conference in Orlando, Florida. Dr. Philip Padrid, a keynote presenter, offered two Masters Classes for veterinarians: one on Feline Asthma and one on the use of Inhaled Medications. Fritz and Kathryn assisted for demonstration purposes. It was a wonderful trip and opportunity. The AeroDawg® is now available. This is a step forward in the successful safer treatment of chronic bronchitis in dogs. For more information, contact the folks at AeroKat®. Complete Site makeover. New content, look, inhaled medication protocol, and testimonials. Language translation by Babelfish, full text search, and unified image galleries. Kathryn is also completing a book on this topic - notice of publication date available via this website. Keep an eye for the announcement in What's New. This site is dedicated to Raja and animals lovers everywhere. 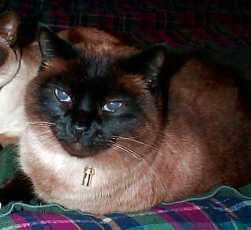 Raja's disappearance in 2001 led us to Fritz, abandoned at a shelter. We have learned from the teaching of Fritz, other asthmatic cats, caregivers, product developers and veterinarians the world over. Best of health to all, Sincerely, James, Kathryn and Fritz the Brave. © 2001-2008 Kathryn Hopper & James Perkins. All rights reserved. Permission is granted to print portions of this website for personal and veterinary reference only. Disclaimer: All material on Fritzthebrave.com is provided for educational purposes only. It is not a substitute for professional veterinary care. Consult your cat's veterinarian regarding all aspects of your cat's health. Fritzthebrave.com provides links to other organizations as a community service and is not responsible for the information, services, or products they provide.